Wild Salads are back in full swing! Marvelous Mint and What To Do With It! Here is a perfect craft cocktail that is cooling and refreshing for these late summer, fresh mint-filled days. If you are into Mint Juleps this version really heightens the mint flavor in a satisfying way. This lightly sweetened liqueur captures the essence of fresh mint. To achieve good flavor, purée the plants, then steep the mixture for a bit of time. Serve at social gatherings, or pour them into attractive bottles and give them away as gifts. The alcohol content of this drink ranges from 25% when using 80 proof to 31% when using 100 proof. • 2 large handfuls fresh leaves or flowering tops of apple mint, peppermint, and spearmint (stripped off main stalk). I like this mint combo, but if you only have one kind of mint, by all means use it. Purée ingredients in a blender, pour into a glass jar, cover with a tight-fitting lid and leave out for about an hour, or for up to four weeks at room temperature. Strain through a fine-mesh sieve, and squeeze the plant material to remove as much liquid as possible. If you would like to remove all plant particles, line the sieve with a thin linen cloth before straining. Serve over crushed ice and garnish each glass with a fresh mint leaf, if available. To store, pour into a glass bottle, cap tightly and keep in a cool, dark place. This Mint Bourbon keeps for at least a year, and although it won’t rot due to the alcohol content, the aromatic flavors decrease with time. There's an exciting bounty to be had in turning wild grape leaves into delicious, nutritious food. Typically used for wrapping around savory rice fillings, with or without ground meat, grape leaves can also be wrapped around other foods such as fish, meatloaf, and more. In our area we are lucky to have an abundance of wild grape vines that appreciate pruning, and in return they reward us with a substantial supply of leaves. Cultivated grapes grown without chemicals provide another great source for leaves; perhaps a grape grower in your area will kindly share some leaves from mid spring through early summer pruning (usually they throw these away). Cook them up fresh and preserve some by marinating, dry canning, freezing, or lacto-fermenting so you can enjoy them throughout the year. You'll find detailed instructions below. Grape leaves fall into the category of “wrap cookery,” along with cabbage, lettuce, spinach, and other wild leaves. Essentially any leaf that is tasty and tender yet strong enough to wrap around food falls into this category. The best time to harvest grape leaves is from mid spring through early summer, when leaves are not too tough and leathery but large enough to effectively wrap around food. Look for newer leaves that are lighter green and tender, found towards the tip of the vine. The best size leaf to harvest is about the size of an average lady’s open hand, roughly measuring 5–6 inches wide; any smaller and they are too difficult to stuff; any larger and they tend to be too tough for eating. Also, choose intact leaves, minimizing ones with bug damage. Remove the leaf stem completely or it can puncture the leaf when rolling or while in storage. Store fresh grapes leaves as you would other leafy greens, such as kale or lettuce, by putting them into a plastic bag placed in the refrigerator, where they will keep for at least two weeks. 1. Spread grape leaf flat on a plate, unfolding any wrinkles. Face shiny side (the upper side of the leaf) down, with the stem remnant (leaf base) closest to you, and leaf tip pointing away from you. When using frozen or dry canned leaves, sprinkle them with a little water if they seem dry and brittle. 2. Place stuffing onto the lower center of the leaf, about an inch away from the leaf base. · If using a raw grain stuffing, use a heaping teaspoon per leaf. · If using a raw grain and meat stuffing, use a heaping teaspoon per leaf. · If using a raw meat stuffing, use a heaping tablespoon per leaf. · If using a cooked stuffing, use a heaping tablespoon per leaf. 3. Fold the leaf base (the edge closest to you) up over the stuffing and then fold the leaf sides toward the center, encasing the stuffing. Continue to roll toward the leaf tip, tucking the leaf sides into the center as you turn, rolling until the leaf tip is incorporated into the final cylindrical shape. 4. Stuffed grape leaves made with marinated leaves and a precooked filling may be eaten right away; ones made with raw filling and leaves need to be cooked and should be placed seam-side down in the cooking vessel to prevent them from unraveling. Spread out on the plate is a marinated leaf I picked and preserved in spring. It awaits a precooked filling. Below is the jar the leaf was pulled out of. I placed a 100 or so grape leaves in this wide-mouth pint mason jar and covered them with a marinade made of olive oil, vinegar, and sea salt. FYI, leaves were first blanched before marinating. The jar, tightly covered, was kept in my refrigerator. I can't say for how long since I forgot to label the jar. Was it last spring or two springs ago? Note to self: label all concoctions. In any case the leaves are still in excellent condition and ready to be filled. To stuff marinated grape leaves, choose a precooked stuffing such as the Grain Salads (p. 136), Grain Pilaf Variations (p. 138), or Bean Salads (p. 139). Naturally, part of the fun is to experiment and invent fillings to suit your fancy. Fill each grape leaf with a heaping tablespoon of stuffing and, if needed, refer to How to Stuff Grape Leaves above. Note: 3 cups of cooked stuffing fills about 32 grape leaves. The stuffing I made yesterday (pictured in the photo below) is a winter variation made with brown rice (soaked and cooked), parsley, almonds (soaked, dried, and lightly roasted), raisins, scallions, dried peppermint, olive oil, vinegar, sea salt and pepper. Grape leaf with a heaping tablespoon of filling placed onto the lower center of the leaf, about an inch away from the leaf base, ready to be rolled. A plate full of stuffed grape leaves ready for the Valentine's day party. More will be served today at the neighborhood seed-sharing gathering. A visual journey — playing with unusual fruit and chocolate to create tasty treats for the holidays. American persimmons (Diospyros virginiana) — a native American winter fruit, picked today on Dec. 10th in the Mid-Hudson Valley of NY. Right now they taste like gooey carmel meets Barhi date in the house of apricot. On the plate with the American persimmons are Morellos, a black sour cherry we picked in July. We put the cherries up in whiskey and maple syrup. The liquid is poured off and sipped as a cordial and the cherries are eaten straight or coated in chocolate. Here is one of the jars we put up back in July. (The photo was taken today.) The cherries are steeping (also referred to as macerating) in the liquid and left at room temperature. No heating or canning used here, just time. When making this, the ratio of cherries, to sweetener, to liquor can vary depending on ones taste buds. However one rule needs to be followed: the concoction needs to contains at least 20% alcohol when finished, also referred to as 40 proof. This amount of alcohol preserves the mixture. You can have a higher alcohol content if you like, but not lower, or funky things can happen. I use organic bittersweet chocolate dollops with a 67% cacoa content that I buy at my Natural Foods Coop in bulk. I gently warm the chocolate in a double boiler, just enough to melt it. Caution: don't over heat the chocolate; proceed slowly and gently. Tim is holding the persimmon by its calyx and dipping it into the chocolate. American persimmon enrobed in chocolate. Once dipped, the fruit is cooled by placing it in the refrigerator, freezer or the chilly outdoors until the chocolate hardens. The platter contains American persimmons and whiskey infused Morello cherries enrobed in bittersweet chocolate. Time to go to the potluck with our platter of unusual fruits dressed in chocolate. Note: make sure to warn folks about the seeds! After resting during the hottest, driest months of the year, field garlic (aka Allium vineale) returns with full vigor. Closely related to chives and scallions, this perennial of the Amaryllidaceae family can be used similarly, offering a strong, pungent, spicy, aromatic onion flavor. Originally from Europe, it now grows prolifically in many parts of the world, especially here in the Northeastern US. Often referred to as onion grass: it looks like grass; flourishes in lawns; and tastes oniony. Also look for field garlic in fields, gardens, and open woods. Why not include field garlic in your food for a little free, wild flavor! Mince it up and add it to salad, soup, frittata, scones, wild green pesto, baked fish and so much more. BTW, it's probably growing right outside your doorstep. For clues on how to identify it properly, please refer to the image here from my book Foraging & Feasting: A Field Guide and Wild Food Cookbook. Field garlic photo taken today. This photo of field garlic shows how much it looks like a clump of grass. Not so helpful in distinguishing it from other plant species. The strongest clue is it's aroma = onion! Again, please refer to the clues on our plant page above for help with accurate identification. Wondering which wild edible to eat right now? = Dandelion. She seems to always be available, offering superior nourishment throughout the growing season. In this mid-fall moment, I like to gather her leaves and add them to salads, adding just enough; too much and the salad becomes too bitter. I also make sure to mince the leaves up, dispersing them well into the milder-tasting greens. This perennial of the Asteraceae, originally from Eurasia, is one of our most common weeds that boasts profound nutrient density: high in beta carotene, vitamin C, calcium and iron. The bitterness, while often not enjoyable to many palates, is quite healthful as a digestive aid and liver tonic. Remember when we support our digestion and our liver — many, many, good things happen. To help with identification, harvest and use please, look below at the Dandelion Plant Map from my book Foraging & Feasting: A Field Guide and Wild Food Cookbook by Dina Falconi; illustrated by Wendy Hollender. 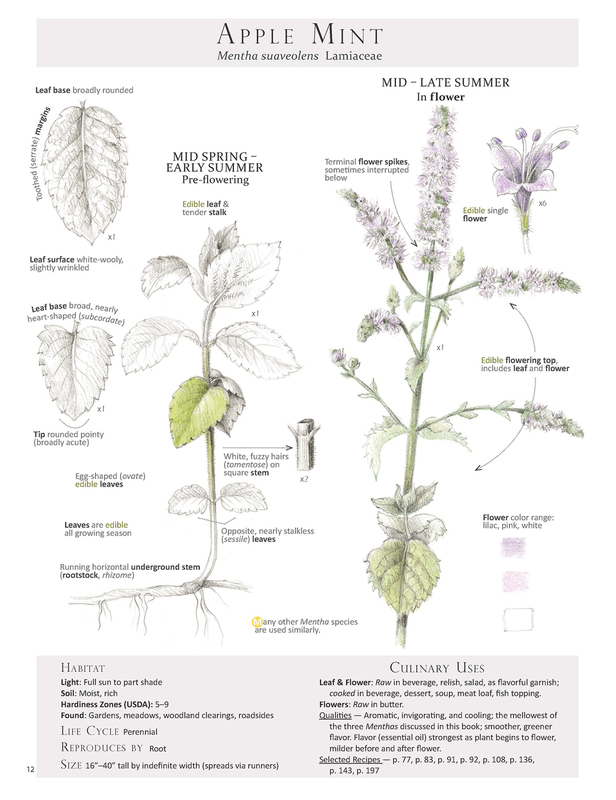 From the book Foraging & Feasting: A Field Guide and wild Food Cookbook by Dina Falconi; illustrated by Wendy Hollender. Today's pawpaw: a visual essay with ice cream option. Pawpaw fruit (Asimina triloba) ready for eating as detected by its alluring tropical odor and soft-to-the-touch skin. Notice the color of the skin turns from light green to slightly yellow with a few brown spots when ripe. This is when I prefer to eat them. Note: although not my preference, some folks wait until the skin turns a grayish-brown-black before eating. A view of the inside of the fruit. Inedible black seeds removed from edible fruit flesh. Seed can be planted right away, or stored in the refrigerator for future planting. For more information on planting seeds and cultivation of trees click here or here or here. For more information on pawpaws in general click here. Remove the flesh from the inedible skin with a spoon or your mouth. The delicious custardy pawpaw flesh is now ready for eating fresh as is; or made into ice cream. BTW, the pawpaw packs an impressive nutritional profile: 3 oz of fruit supplies more than half of our daily iron needs and over a third of our daily magnesium needs! That's a lot of nutrient density for a fruit. Click to see more nutritional information. Now is the time for harvesting and processing black walnut (Juglans nigra of the Juglandaceae family). The green hull will go into organic cold pressed olive for a therapeutic anti-fungal oil-come-salve and the musky-flavored nut meat will go into our mouths. Prized for its wood in furniture-making, this large, native Eastern North American tree can be found growing in USDA zones 4-9. Now is the time for gathering these fallen fruits. Free Food & Free Medicine! A basket of black walnuts gathered last week from the ground under the tree. Processing black walnuts: the crime scene. The green hull removed from the nut shell with a simple paring knife. This part will be used for making medicine. BTW, the green hull begins to brown as soon as it is cut open and comes into contact with the air. Technique: cracking the nut open with a stone. If you want to get fancy, friends of mine who love eating black walnuts own the Hunt's Black Walnut Nut Cracker, available from Northern Nut Growers Association. FYI, even with this tool, shelling the nuts is a slow, meditative affair. An even fancier option is the World's Best Nut Cracker — heavier duty, more expensive, and faster output. A close up of a cracked black walnut: the white flesh is the edible part and needs to be removed from the shell. Stone for cracking; nut shell remnants (to compost); and nut meat to eat. The yellowish-white black walnut meat ready to eat. Can be used instead of other nuts in cooking. Don't forget to wear gloves when working with black walnuts as they have a strong dye that will stain your hands; the staining lasts up to three weeks. More #WildBerry picking: #blackberries w/ a few #raspberries. Gathered about 3 gallons this morning. The blackberries are very tasty and super abundant this year! Turning most of the berries into coulis and then freezing the coulis to use throughout the year. Today's featured blackberry recipe here at the house will be ice cream made w/ fresh raw grassfed cream. #WildBergamot blooming beautifully= food for the #Pollinators and for us. Right now it's time to indulge in those lovely, light lavender #EdibleFlowers full of spicy sweetness. Sprinkle them onto salads; blend them into softened butter; use them as a flavorful garnish throughout. This wild American native, aka #Mondarda fistulosa, is a perennial of the Lamiaceae family. Look for it in meadows, clearings, prairies, thickets and gardens. Harvest the flowering tops to brew into a strong flavorful tea with a spicy, pungent, oregano-like flavor; has cleansing and digestive promoting qualities.